A new bill on individual bankruptcy procedures has been passed in the State Duma. News of the bill was initially welcomed by many Russians as an opportunity to ease debt burdens, but enthusiasm for the bill may soon weaken as more details come to light. Under the new bill, Russians in debt could lose their only apartments, and entire families may be liable for the individual debts of relatives. The bill on bankruptcy procedures for individuals has been under discussion for two weeks already. The State Duma passed the bill after its first reading in mid-October. No one knows what the law’s final version will be, but many people are already pleased with it. Magram Market Research has recently released the overwhelming results of a survey held among 1,500 Russian respondents: 76 percent of respondents supported the idea of bankruptcy procedures for individual debtors, and over half of the respondents plan to solve the problem of their debts by means of this law. This optimism is likely rooted in the way in which the future law has been presented. Deputies introduced it as a new instrument to assist people deep in complicated relations with creditors. This is a true representation, in many ways. If a debtor fails to settle with creditors, he or she may apply to the court of arbitration and restructure the debt for five years, if the creditors agree. Otherwise, a person is recognized as bankrupt and, after any property is sold, he or she owes nothing. The idea looks especially attractive to a person who owns nothing but owes millions. It is assumed that, as soon as a debtor submits a request to be recognized as bankrupt, all his or her obligations will be frozen. This means that loan interest rates and late payment penalties will also cease to be charged. And furthermore, the law will define which of the debtor’s property may not be sold. This concerns, for instance, the case in which there is only one apartment owned. As soon as the bill on bankruptcy procedures for individuals was passed in the first hearing, everyone who had the chance to edit it set about enthusiastically trying to improve upon it. For instance, the bankruptcy threshold is still being disputed. At present, the sum of debt necessary to begin the bankruptcy procedure is 50,000 rubles ($1,600). Nikolai Zhuravlyov, a member of the Federation Council Committee for Budget and Financial Markets, proposes increasing the sum up to 200,000 rubles, while the chairman of the State Duma Committee on Property, Sergei Gavrilov, thinks that 100,000 rubles will be enough. Regardless of the exact figure, the debt threshold might be the most innocent amendment introduced by lawmakers. “For some reason, people are not told that they will be deprived of their apartments!” said Andrei Vlass, vice president of the Association of Debt Management Organizations. The proposal to do so is listed in the amendments. Duma deputies believe that a constitutional provision for immunity of sole housing should be reconsidered in the case of individual debtors. “An apartment is the most comprehensive and liquid asset for people,” said a partner for Lex Borealis law firm, Alexei Peshkov. Currently, it is almost impossible to deprive a debtor of his or her only apartment to settle the debt, even if it is a multi-room penthouse in the center of Moscow. “Do you really think that, if you owe some millions and cannot pay your debt but live in a good apartment in Moscow, your debt will be forgiven by your creditor?” said Vlass. The other important issue is that the individual bankruptcy procedure may be initiated both by the debtor and the creditor. When the law on individual insolvency is discussed, it is generally taken for granted that the situation concerns relations between the debtor and the bank. A debt sufficient for initiating a bankruptcy procedure, however, can also be accumulated on housing service payments, for example. By current laws, the main risk that a person possessing such a debt runs is being prohibited to leave the country, and this is irrelevant for many people. However, attitudes toward housing service payments might change if people run a real risk of losing an apartment and having to move, for instance, to a far end of new Moscow into smaller apartments. In this case, managing companies would not even have to apply to the court each time, as the threat of initiating a bankruptcy procedure would be sufficient for many people. 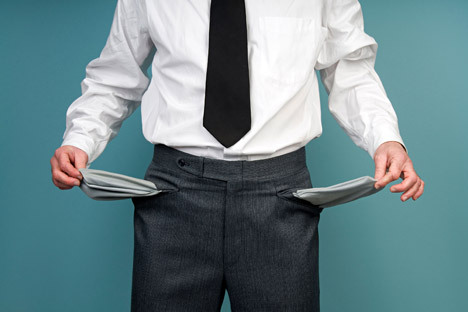 According to the bill, a bankruptcy procedure may be initiated by any authorized person. This implies that the group of people who may have problems after this law is adopted will significantly increase. The Federal Tax Service (FTS), for instance, may act as an authorized person. So, if taxes on transport and housing are not paid, this might result in the loss of corresponding property. The same is theoretically true for those who do not pay fines for traffic-related violations. In late November, the deputy head of the FTS, Denis Naumchev, announced that the agency had submitted a package of proposals intended to “regulate family-related debt problems” to the State Duma. “What is the way to select the property share subject to sale for one’s debts and the share to be left to children?” asked Georgy Koltashov, head of the Directorate for Debt Settlement and Bankruptcy Proceeding Support at the FTS. The amendment that would enable recognizing entire families as bankrupt if necessary is not the only news that was learned from tax officials. Koltashov also told the media about a new information system implemented at the FTS. “It will enable us to trace how and to whom taxpayers transfer their property, and to register profit-expenditure discrepancies,” Koltashov said. As far as relations between individuals and banks are concerned, the enthusiasm of many borrowers who hope to get rid of their debts easily is likely to weaken after the prepared amendments are adopted. Although, if a debtor really fails to pay the debt, then both sides ‒ the debtor and the bank ‒ will benefit. The borrower will get rid of his or her debts, while the bank will receive some funds and deduct a bad loan from its balance. Bankers, however, are afraid of other cases of individual bankruptcy. “As doing business in Russia has its peculiarities, a considerable part of a bank’s loan portfolio is guaranteed by the ultimate beneficiaries of the business. And they will start using bankruptcy in order not to fulfill their obligations,” Sergei Letunov, general counsel at Probusinessbank, said.